Hire Cantilever Scaffold Tower. Fast Delivery From Stock. Do you need to overcome obstacles e.g. machinery, porches etc. that are underneath the working area? You can now convert double width scaffold towers to provide access up to 1.25m outside the tower handrail by using a Cantilever section. This equipment is only available from our London depot. Using a scaffold tower for extra safety when working at height is a must but what happens if you have obstacles that are physically in the way? 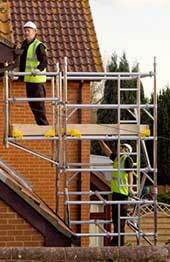 Well, the answer for both commercial and domestic markets is to hire a cantilever scaffold tower. Whether the obstacle is something large and immovable like a porch or machinery or just simply uneven ground, the cantilever scaffold tower has all the solutions. The section comes in 13 pieces and can be easily added to an existing scaffold tower. Just like standard towers, the cantilever scaffold tower offers you complete freedom and safety to carry out your job with total peace of mind. The cantilever is just as stable as the standard scaffold tower and eliminates the risk of a fall from height, one of the biggest killers in the workplace today. And with the HSE reporting 35 deaths, 4,654 major injuries and 7,065 injuries which resulted in the injured person having to stay off work for more than three days due to a fall from height in 2008/9, safety has to be at the forefront of any job. Providing a cost-effective solution to a range of problems, the cantilever scaffold tower offers access to all the hard to reach exterior areas allowing professionals to reach over fixed machinery where a standard tower is not appropriate. Professionals can even use cantilever scaffold towers to gain access over shop front canopies allowing them to carry out gutter repairs and painting. Scaffold towers are so easy to erect, they can be put up in 30 minutes making a safe, comfortable platform to work from, especially in less than perfect weather conditions. And the best bit is that the cantilever scaffold tower is completely interchangeable with standard fittings which means you adjust it to fit the job at hand. Whatever you needs, safety should be your very first consideration and the cantilever scaffold tower will enable you to access your work with complete security.